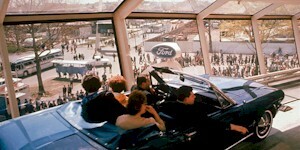 With the introduction of the Mustang at the 1964 Worlds Fair in New York, Walt Disney created a unique Magic Skyway ride at the Ford Motor Wonder Rotunda. They used real Mustang convertible on the ride! There were twelve 1964 Mustang convertible converted to run on the Magic Skyway track. Their VIN range was 5F08F100003 through 100014. The breakdown were: three Wimbledon White Mustangs (5F08F100006, 5F08F100007, and 5F08F100008); three Raven Black Mustangs (5F08F100003, 5F08F100004, 5F08F100005); three Guardsman Blue Mustangs (5F08F100009, 5F08F100010, 5F08F100011), and three Rangoon Red Mustangs (5F08F100012, 5F08F100013, 5F08F100014). These cars were later replaced with 1965 Mustangs and converted for resale to the public. At the Ford Motor Wonder Rotunda at the 1964 World's Fair in New York was a ride called the Magic Skyway built by Walt Disney. Twelve early production 1964 Mustangs where converted for use on this ride. They were 5F08F cars sequenced 100003 through 100014. Later in the year, the cars were removed and replaced with 65 models. They were converted back to stock and sold used. Some are known to still exist today.